This article is about the Catholic rites. For other uses, see Sacrament (disambiguation). There are seven sacraments of the Catholic Church, which according to Catholic theology were instituted by Jesus and entrusted to the Church. Sacraments are visible rites seen as signs and efficacious channels of the grace of God to all those who receive them with the proper disposition. 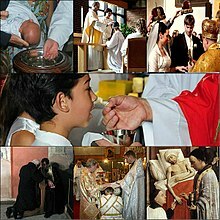 The sevenfold list of sacraments is often organized into three categories: the sacraments of initiation (into the Church, the body of Christ), consisting of Baptism, Confirmation, and the Eucharist; the sacraments of healing, consisting of Reconciliation and Anointing of the Sick; and the sacraments of service: Holy Orders and Matrimony. The Catechism of the Catholic Church lists the sacraments as follows: "The whole liturgical life of the Church revolves around the Eucharistic sacrifice and the sacraments. There are seven sacraments in the Church: Baptism, Confirmation or Chrismation, Eucharist, Penance, Anointing of the Sick, Holy Orders, and Matrimony." Dogma includes divine revelation, i.e., the word of God (bible and tradition) and the word of God incarnate (Jesus), and truths connected to divine revelation. The sacraments, divinely instituted, are dogma and are part of the liturgy, that is, public worship. As dogma is immutable, Baptism cannot be changed to allow a non-Trinitarian formula, the Eucharist cannot be changed to allow unrepentant sinners to receive Jesus, Matrimony cannot be changed to allow gay marriage, and Holy Orders cannot be changed to allow priestesses. The Catholic Church teaches that the sacraments are "efficacious signs of grace, instituted by Christ and entrusted to the Church, by which divine life is dispensed to us. 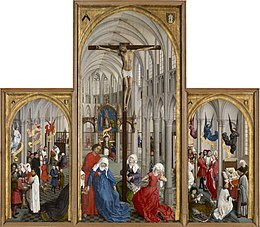 The visible rites by which the sacraments are celebrated signify and make present the graces proper to each sacrament. They bear fruit in those who receive them with the required dispositions." While the Church itself is the universal sacrament of salvation, the sacraments of the Catholic Church in the strict sense are seven sacraments that "touch all the stages and all the important moments of Christian life: they give birth and increase, healing and mission to the Christian's life of faith". "The Church affirms that for believers the sacraments of the New Covenant are necessary for salvation", although not all are necessary for every individual, and has placed under anathema those who deny it: "If any one saith, that the sacraments of the New Law are not necessary unto salvation, but superfluous; and that, without them, or without the desire thereof, men obtain of God, through faith alone, the grace of justification;-though all (the sacraments) are not indeed necessary for every individual; let him be anathema." The Church further teaches that the effect of a sacrament comes ex opere operato, by the very fact of being administered, regardless of the personal holiness of the minister administering it. However, a recipient's own lack of proper disposition to receive the grace conveyed can block the effectiveness of the sacrament in that person. The sacraments presuppose faith and through their words and ritual elements, nourish, strengthen and give expression to faith. The Compendium of the Catechism of the Catholic Church states: "Christian initiation is accomplished by means of the sacraments which establish the foundations of Christian life. The faithful born anew by Baptism are strengthened by Confirmation and are then nourished by the Eucharist." The Catholic Church sees baptism as the first and basic sacrament of Christian initiation. In the Western or Latin Church, baptism is usually conferred today by pouring water three times on the recipient's head, while reciting the baptismal formula: "I baptize you in the name of the Father and of the Son and of the Holy Spirit" (cf. Matthew 28:19). In the Eastern Catholic Churches of Byzantine Rite immersion or submersion is used, and the formula is: "The servant of God, N., is baptized in the name of the Father, and of the Son, and of the Holy Spirit." Though sprinkling is not normally used, its validity is accepted, provided that the water flows over the skin, since otherwise it is not a washing. Confirmation or Chrismation is the second sacrament of Christian initiation. "It is called Chrismation (in the Eastern Churches: anointing with holy myron or chrism) because the essential rite of the sacrament is anointing with chrism. It is called Confirmation because it confirms and strengthens baptismal grace." It is conferred by "the anointing with Sacred Chrism (oil mixed with balsam and consecrated by the bishop), which is done by the laying on of the hand of the minister who pronounces the sacramental words proper to the rite." These words, in both their Western and Eastern variants, refer to a gift of the Holy Spirit that marks the recipient as with a seal. Through the sacrament the grace given in baptism is "strengthened and deepened." Like baptism, confirmation may be received only once, and the recipient must be in a state of grace (meaning free from any known unconfessed mortal sin) in order to receive its effects. The "originating" minister of the sacrament is a validly consecrated bishop; if a priest (a "presbyter") confers the sacrament — as is done ordinarily in the Eastern Churches and in special cases (such as the baptism of an adult or in danger of the death of a young child) in the Latin Church (CCC 1312–1313) — the link with the higher order is indicated by the use of oil (known as "chrism" or "myron") blessed by the bishop on Holy Thursday itself or on a day close to it. In the East, which retains the ancient practice, the sacrament is administered by the parish priest immediately after baptism. In the West, where the sacrament is normally reserved for those who can understand its significance, it came to be postponed until the recipient's early adulthood; in the 20th century, after Pope Pius X introduced first Communion for children on reaching the age of discretion, the practice of receiving Confirmation later than the Eucharist became widespread; but the traditional order, with Confirmation administered before First Communion, is being increasingly restored. The Eucharist, also called the Blessed Sacrament, is the sacrament (the third of Christian initiation, the one that the Catechism of the Catholic Church says "completes Christian initiation") by which Catholics partake of the Body and Blood of Jesus Christ and participate in his one sacrifice. The first of these two aspects of the sacrament is also called Holy Communion. The bread (which must be wheaten, and which is unleavened in the Latin, Armenian and Ethiopic Rites, but is leavened in most Eastern Rites) and wine (which must be from grapes) used in the Eucharistic rite are, in Catholic faith, transformed in their inner reality, though not in appearance, into the Body and Blood of Christ, a change that is called transubstantiation. "The minister who is able to confect the sacrament of the Eucharist in the person of Christ is a validly ordained priest alone." The word "priest" here (in Latin sacerdos) includes both bishops and those priests who are also called presbyters. Deacons as well as priests (sacerdotes) are ordinary ministers of Holy Communion, and lay people may be authorized in limited circumstances to act as extraordinary ministers of Holy Communion. The Eucharist is seen as "the source and summit" of Christian living, the high point of God's sanctifying action on the faithful and of their worship of God, the point of contact between them and the liturgy of heaven. So important is it that participation in the Eucharistic celebration (see Mass) is seen as obligatory on every Sunday and holy day of obligation and is recommended on other days. Also recommended for those who participate in the Mass is reception, with the proper dispositions, of Holy Communion. This is seen as obligatory at least once a year, during Eastertide. As a growing trend during the second half of the 2010s, many US dioceses of Latin Rite are officially returning to the traditional order of the three sacraments of Christian initiation, that is: Baptism, Confirmation and, lastly, the first Communion. This order of Sacraments is referenced in the Catechism of the Catholic Church (n. 1212), and “The holy Eucharist completes Christian initiation” (n. 1322). The current order — with Eucharist preceding the Confirmation — was started in 1910 with the decree by Pope Pius X, Quam Singulari Christus Amore (transl. : “How Special Christ’s Love”), which said Communion should not be delayed beyond when a child reaches the age of reason. U.S. dioceses complied at that time, but they did not bring confirmation forward with it in a subsequent age. The Sacrament of Penance is the first of two sacraments of healing. The Catechism of the Catholic Church mentions in the following order and capitalization different names of the sacrament, calling it the sacrament of conversion, Penance, confession, forgiveness and Reconciliation. It is the sacrament of spiritual healing of a baptized person from the distancing from God resulting from sins committed. When people sin after baptism, they cannot have baptism as a remedy; Baptism, which is a spiritual regeneration, cannot be given a second time. "Many sins wrong our neighbour. One must do what is possible in order to repair the harm (e.g., return stolen goods, restore the reputation of someone slandered, pay compensation for injuries). Simple justice requires as much. But sin also injures and weakens the sinner himself, as well as his relationships with God and neighbour. Absolution takes away sin, but it does not remedy all the disorders sin has caused. Raised up from sin, the sinner must still recover his full spiritual health by doing something more to make amends for the sin: he must 'make satisfaction for' or 'expiate' his sins. This satisfaction is also called 'penance'" (CCC 1459). In early Christian centuries, this element of satisfaction was quite onerous and generally preceded absolution, but now it usually involves a simple task for the penitent to perform later, in order to make some reparation and as a medicinal means of strengthening against further temptation. The priest is bound by the "seal of confession", which is inviolable. "Accordingly, it is absolutely wrong for a confessor in any way to betray the penitent, for any reason whatsoever, whether by word or in any other fashion." A confessor who directly violates the sacramental seal incurs an automatic excommunication whose lifting is reserved to the Holy See. In some dioceses, certain sins are "reserved" which means only certain confessors can absolve them. Some sins, such as violation of the sacramental seal, consecration of bishops without authorization by the Holy See, direct physical attacks on the Pope, and intentional desecration of the Eucharist are reserved to the Holy See. A special case-by-case faculty from the Sacred Penitentiary is normally required to absolve these sins. When, in the Western Church, the sacrament was conferred only on those in immediate danger of death, it came to be known as "Extreme Unction", i.e. "Final Anointing", administered as one of the Last Rites. The other Last Rites are Confession (if the dying person is physically unable to confess, at least absolution, conditional on the existence of contrition, is given), and the Eucharist, which when administered to the dying is known as "Viaticum", a word whose original meaning in Latin was "provision for a journey". Holy Orders is the Sacrament by which a man is made a bishop, a priest, and thus dedicated to be an image of Christ, or as a deacon, dedicated for service to the church. The three degrees are referred to, respectively, as the episcopate, the presbyterate and the diaconate. The bishop is the only minister of this sacrament. Ordination as a bishop confers the fullness of the sacrament, making the bishop a successor to the Apostles, a member of the College of Bishops, and giving him the threefold office to teach, sanctify, and govern the People of God. Ordination as a priest configures the priest as Christ the Head of the Church, the one essential High Priest, and conferring on him the power, as the bishops' assistant, to celebrate the sacraments and other liturgical acts, especially the Eucharist. Ordination as a deacon configures the man in the service of the bishop, especially in the Church's exercise of Christian charity towards the poor, and preaching of the word of God. Men who discern a vocation to the priesthood are required by canon law (canon 1032 of the Code of Canon Law) to undertake a seminary program that includes, as well as graduate level philosophical and theological studies, a formation program that includes spiritual direction, retreats, apostolate experience, Latin training, etc. The course of studies in preparation for ordination as a "permanent" deacon is decided by the regional episcopal conference. Matrimony, or Marriage, is another sacrament that consecrates for a particular mission in building up the Church, and that provides grace for accomplishing that mission. This sacrament, seen as a sign of the love uniting Christ and the Church, establishes between the spouses a permanent and exclusive bond, sealed by God. Accordingly, a marriage between baptized people, validly entered into and consummated, cannot be dissolved. The sacrament confers on them the grace they need for attaining holiness in their married life and for responsible acceptance and upbringing of their children. As a condition for validity, the sacrament is celebrated in the presence of the local Ordinary or Parish Priest or of a cleric delegated by them (or in certain limited circumstances a lay person delegated by the diocesan Bishop with the approval of the Episcopal Conference and the permission of the Holy See) and at least two other witnesses, though in the theological tradition of the Latin Church the ministers of the sacrament uniquely are the couple themselves. For a valid marriage, a man and a woman must express their conscious and free consent to a definitive self-giving to the other, excluding none of the essential properties and aims of marriage. If one of the two is a non-Catholic Christian, their marriage is licit only if the permission of the competent authority of the Catholic Church is obtained. If one of the two is not a Christian (i.e. has not been baptized), the competent authority's dispensation is necessary for validity. As stated above, the effect of the sacraments comes ex opere operato (by the very fact of being administered). Since it is Christ who works through them, their effectiveness does not depend on the worthiness of the minister. The belief that the validity of the sacrament is dependent upon the holiness of the administrator was rejected in the Donatist crisis. However, an apparent administration of a sacrament is invalid, if the person acting as minister does not have the necessary power (as if a deacon were to celebrate Mass). They are also invalid if the required "matter" or "form" is lacking. The matter is the perceptible material object, such as water in baptism or wheaten bread and grape wine for the Eucharist, or the visible action. The form is the verbal statement that specifies the signification of the matter, such as, (in the Western Church), "N., I baptize thee in the name of the Father, and of the Son, and of the Holy Ghost". Furthermore, if the minister positively excludes some essential aspect of the sacrament, the sacrament is invalid. This last condition lies behind the 1896 judgement of the Holy See denying the validity of Anglican Orders. A sacrament may be administered validly, but illicitly, if a condition imposed by canon law is not observed. Obvious cases are administration of a sacrament by a priest under a penalty of excommunication or suspension, or an episcopal ordination without the Pontifical mandate (except in certain circumstances outlined in Canon Law). Canon law specifies impediments to reception of the sacraments of orders and marriage. Those concerning the first of these two sacraments only concern liceity, but "a diriment impediment renders a person incapable of validly contracting a marriage" (canon 1073). In the Latin Church, only the Holy See can authentically declare when divine law prohibits or invalidates a marriage, and only the Holy See has the right to establish for those who are baptised other impediments to marriage (canon 1075). But individual Eastern Catholic Churches, after having fulfilled certain requirements that include consulting (but not necessarily obtaining approval from) the Holy See, may establish impediments. If an impediment is imposed by merely ecclesiastical law, rather than being a matter of divine law, the Church may grant a dispensation from the impediment. Conditions for validity of marriage such as sufficient use of reason (canon 1095) and freedom from coercion (canon 1103), and the requirement that, normally, a marriage be contracted in the presence of the local Ordinary or parish priest or of the priest or deacon delegated by either of them, and in the presence of two witnesses (canon 1108), are not classified in the Code of Canon Law as impediments, but have much the same effect. Three of the sacraments may not be repeated: Baptism, Confirmation and Holy Orders: their effect is permanent. This teaching has been expressed by the images of, in the West, an indelible character or mark and of, in the East, a seal (CCC 698). However, if there is doubt about the validity of the administration of one or more of these sacraments, a conditional form of conferral may be used, such as: "If you are not already baptized, I baptize you …"
In the recent past, it was common practice in the Catholic Church to baptize conditionally almost every convert from Protestantism because of a perceived difficulty in judging about the validity in any concrete instance. In the case of the major Protestant denominations, agreements involving assurances about the manner in which they administer baptism has ended this practice, which sometimes continues for other groups of Protestant tradition. The Catholic Church has always recognized the validity of baptism in the Eastern Orthodox Church, but it has explicitly denied the validity of the baptism conferred in the Church of Jesus Christ of Latter-day Saints. It does not recognize a baptismal ceremony in which the names of the three divine persons (or hypostases) of the Trinity—Father, Son and Holy Spirit—are replaced by descriptors such as Creator, Redeemer and Sanctifier, or Creator, Liberator, and Sustainer, and requires that the conditional form should not be used when baptizing those who have received this kind of baptism. ^ J. Waterworth (1848). "The canons and decrees of the sacred and oecumenical Council of Trent" (PDF). Documenta Catholica Omnia. Retrieved 2018-02-22. ^ Catechism of the Catholic Church 97 "Sacred Tradition and Sacred Scripture make up a single sacred deposit of the Word of God" (DV 10) in which, as in a mirror, the pilgrim Church contemplates God, the source of all her riches. ^ Catechism of the Catholic Church 73 God has revealed himself fully by sending his own Son, in whom he has established his covenant for ever. The Son is his Father's definitive Word; so there will be no further Revelation after him. ^ Catechism of the Catholic Church 88 ...dogmas, that is,...truths contained in divine Revelation or also...truths having a necessary connection with these. ^ Catechism of the Catholic Church 1210 Christ instituted the sacraments of the new law. There are seven: Baptism, Confirmation (or Chrismation), the Eucharist, Penance, the Anointing of the Sick, Holy Orders and Matrimony. ^ Catechism of the Catholic Church 1070 In the New Testament the word "liturgy" refers not only to the celebration of divine worship but also to the proclamation of the Gospel and to active charity. ^ Catechism of the Catholic Church 1205 "In the liturgy, above all that of the sacraments, there is an immutable part, a part that is divinely instituted and of which the Church is the guardian, and parts that can be changed, which the Church has the power and on occasion also the duty to adapt to the cultures of recently evangelized peoples." ^ A New Response of the Congregation for the Doctrine of the Faith on the Validity of Baptism Trinitarian faith calls for careful precision in language. If the substitution of the names of the divine Persons in the baptismal formula by other names that are proper to each of them (Parent, Child and Issue from both) had given rise to such serious doubt among theologians that Thomas Aquinas considered it invalid, then there is all the more reason to hold that what is conferred with the formulas considered in the questions presented to the Congregation for the Doctrine of the Faith is not true Baptism. ^ Catechism of the Catholic Church 1385 Anyone conscious of a grave sin must receive the sacrament of Reconciliation before coming to communion. ^ Catechism of the Catholic Church 2357 Basing itself on Sacred Scripture, which presents homosexual acts as acts of grave depravity, tradition has always declared that "homosexual acts are intrinsically disordered." They are contrary to the natural law. They close the sexual act to the gift of life. They do not proceed from a genuine affective and sexual complementarity. Under no circumstances can they be approved. ^ Catechism of the Catholic Church 1577 The Lord Jesus chose men (viri)... The Church recognizes herself to be bound by this choice made by the Lord himself. For this reason the ordination of women is not possible. ^ "Lumen Gentium: chapter 7, section 48, paragraph 2". Retrieved 26 July 2012. ^ While in the English language, the word "priest" usually means someone received into the second of the three holy orders (also called the presbyterate) but not into the highest, that of bishop, the Latin text underlying this statement uses the Latin term sacerdos, which comprises both bishops and, in the common English sense, priests. To refer exclusively to priests in the more common English sense, Latin uses the word presbyter. See Dennis Chester Smolarski, The General Instruction of the Roman Missal, 1969–2002: A Commentary (Liturgical Press 2003 ISBN 9780814629369), p. 24. ^ N. LaPoint (May 21, 2015). "A brief catechism on the "restored order"". Archived from the original on September 15, 2015. Retrieved May 7, 2018. ^ US Conference of Catholic Bishops. Compendium: Catechism of the Catholic Church. USCCB Publishing. p. 93. ISBN 978-1-57455-720-6. ^ Code of Canon Law, canon 869; cf. New Commentary on the Code of Canon Law By John P. Beal, James A. Coriden, Thomas J., pp. 1057–1059. ^ "Response of the Congregation for the Doctrine of the Faith". Vatican.va. 5 June 2001. Retrieved 26 March 2010. ^ "Response of the Congregation for the Doctrine of the Faith". Vatican.va. 1 February 2008. Retrieved 26 March 2010. Poschmann Bernhard SJ (1963). Penance and the Anointing of the Sick. The Herder History of Dogma. Fr. Courtney SJ (transl. from German). Freiburg – London: Herder - Burns & Oates. p. 257. Liam G. Walsh OP (1988), The Sacraments of Christian Initiation. Baptism, Confirmation, Eucharist. London: Geoffrey Chapman, ISBN 0 225 66499 2, pp. 317. Vogel C. (1982). Le pécheur et la pénitence dans l'Église ancienne. Paris: Cerf. p. 213. ISBN 2-204-01949-6. Vogel C. (1982). Le pécheur et la pénitence au moyen-age. Paris: Cerf. p. 245. ISBN 2-204-01950-X. Thomas Aquinas, Summa Theologiae, "On the Sacraments in general (III qq. 60–64)"
This page was last edited on 23 April 2019, at 11:28 (UTC).